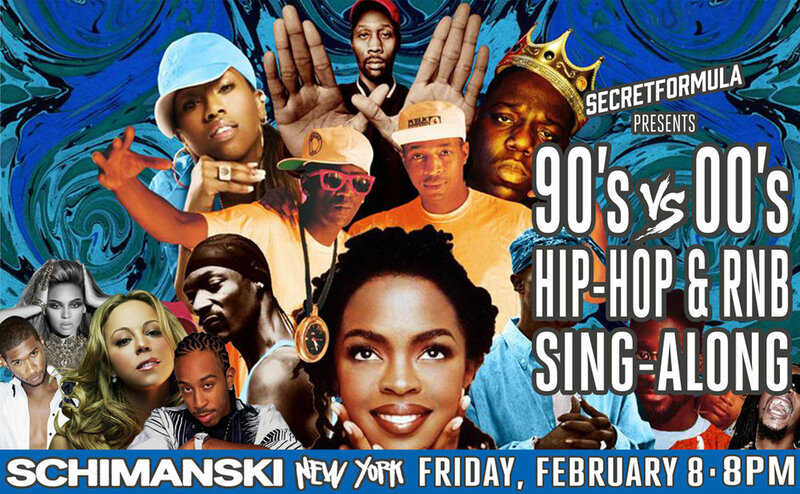 The most iconic names of the decades will be represented in Schimanski’s Hip Hop Room on Friday, February 8th, including TLC, 2Pac, Usher, DMX, Ginuwine, Biggie, Wu-Tang Clan, Destiny’s Child, Kanye, Puff Daddy, Ludacris, Coolio, Sisqo, Snoop Dogg, and many, many more! After the Sing-Along, DJ Bengey takes the party to the next level, spinning even more hip hop hits with a dance party that'll keep you on your feet til the clock strikes midnight. There will be drink specials on beer and well drinks throughout the night. Dressing in your 90’s or 2000's gear encouraged.